Gilliam is a messy, messy director. In this film, he comments on bureaucracy run amok, superficiality, corporate mindlessness, urban ugliness, action movie clichés, and government that has lost sight of humanity. It’s a big, ambitious movie with big, ambitious themes. It often threatens to collapse under the weight of it all, much like the overdeveloped structures that populate this world. But more than any other Gilliam film, it manages to hold up. Part of this — a large part — is the consistently stunning, original, inventive production design. 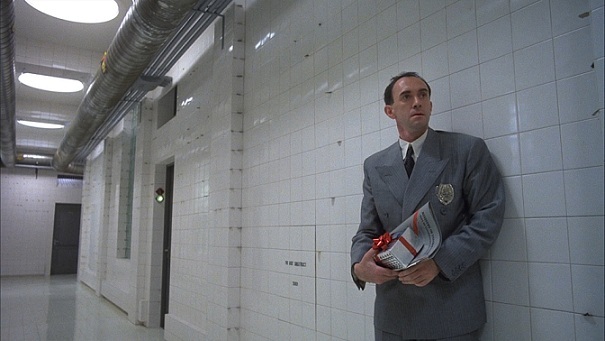 There isn’t a frame of film here that doesn’t help build Gilliam’s dystopian vision. The ever-present ducts and vents, the stale imposing buildings of the government and the decrepit urban monstrosities of the residences, doodads heaped on top of gizmos, computer screens shrunken down so small they need magnifying glasses, tiny cars and giant lorries, billboards and propaganda posters, and simple things made insanely complicated. Some of this vision is rather prescient (ever seen one of those SmartCars?). All of it seems perfect, the best possible realization of Gilliam’s distorted worldview. And his satirical bite is mostly spot-on. My favorite moment is when Lowry tries to be the stereotypical hero, using reckless abandon to do what he thinks is gutsy. He cheers for his triumph over the “bad guys”… only to realize that they’re suffering horribly from his actions, that the “bad guys” are human beings, not disposable props for the blockbluster movie of his imagination. Sam Lowry is a dreamer, but his dreams are repeatedly beaten down by awfulness. There are problems, though. Some of the humor feels rather broad, picking easy targets (and I could do without the gross-out sewage and coffin images). And I’m certainly not endorsing the infamous “Love Conquers All” abomination, but Gilliam’s preferred cut really does feel a little long. And Kim Greist is a disastrous casting choice. It would be one thing if she were trying to be so bland… the way Sam allows his fantasies to get the best of him, it would be a fitting touch for his dream girl to be such a dud in reality. But I don’t think Greist is trying to be a dud. She’s trying to be… I dunno, “spunky” or something. Whatever it is, her delivery is awful and she has no presence. I should listen to Gilliam’s commentary again and see what he has to say about her. This entry was posted on December 15, 2012 at 2:17 am	and is filed under Movie Reviews. You can follow any responses to this entry through the RSS 2.0 feed. You can leave a response, or trackback from your own site. According to Battle of Brazil, Gilliam cast Griest basically on the advice of his wife and the casting director, over his own internal qualms, and wasn’t really happy with how her performance turned out- he tried to minimize her in editing to the extent that he could. I think her performance is just okay, but you do wonder what might have been. Ah, thanks! I’d forgotten all that, been a long time since I watched that doc. Do they say anything about who Gilliam wanted for the role? I can picture maybe a Roseanna Arquette.